I was poking around on eBay the other day and came across this item. After receiving it in the mail yesterday, I had to share! No…it isn’t a postcard, but it is pretty special! If you have been reading this blog for a while, you will remember when I posted the video of “The Wise Little Hen”, the premiere of Donald Duck. That was 1934. 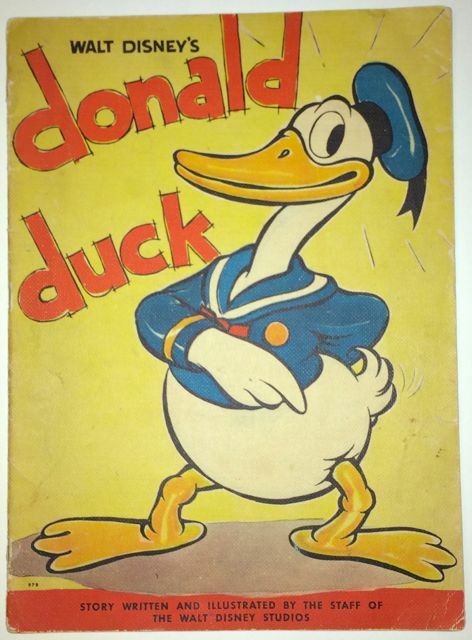 This comic, or more accurately, large format children’s book, is the first book to feature Donald Duck on the cover. It was published in 1935. It is not is a comic book in the classical form, but is larger and has thicker card-like paper stock for pages. 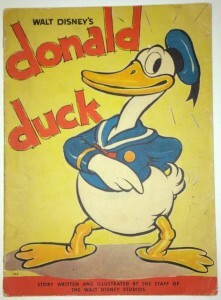 But the early cover of Donald Duck is fantastic! Style, flair, attitude! In really nice condition, this book will set you back a fair bit. But I was fortunate to get this one shown here for a very reasonable $80. This entry was posted in Disney and tagged Donald Duck, The Wise Little Hen. Bookmark the permalink.